WhatsApp is huge in India. It reaches the common man much more than Facebook or Twitter does in India. It’s so big that government authorities in India use WhatsApp for information dissemination or even to get information. For a lot of people in India, WhatsApp has become the window to the Internet. Many in the country now use WhatsApp to get news. Most of them get this news while being part of a big group as ‘forwards’. This makes it a rich medium for any controversial news to go viral. Also a good medium for scammers. It is it to be noted that even the PM of India has difficulty in identifying the truthfulness of an item which turned out to be clearly fake. The alternative is that he knew that it was false but wanted to stay clean with the disclaimer. Either way, it shows clearly how big the WhatsApp market is for false news and how quickly they become viral. “Do you know what is the best security feature of the new Rs.2000/- note released by RBI, you will be surprised to know how Modi is playing the game. It is printed by intaglio printing method and hence is a colour shredding note. Means the colour of the note will gradually disappear and in a span of maximum 3 years the note will lose all its pink colour and almost become a white paper which will be invalid. 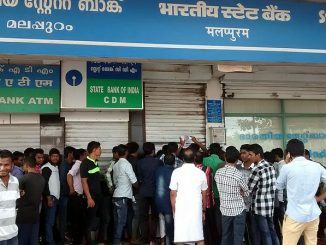 Even if you stock the note it will become invalid in 3 years , so it has to come to bank after 2 year if you want it to be valid. So every 3 years it is an automatic demonetization of RS 2000/- note. Now let’s see how people stock the black money. The message above is another WhatsApp forward a friend of mine received. Check the last line Forwarded…As received, which is somewhat akin to “I don’t know how far it is true”. It means that the forwarder knows that it’s probably fake, but still wants to spread the news without taking any responsibility for it. 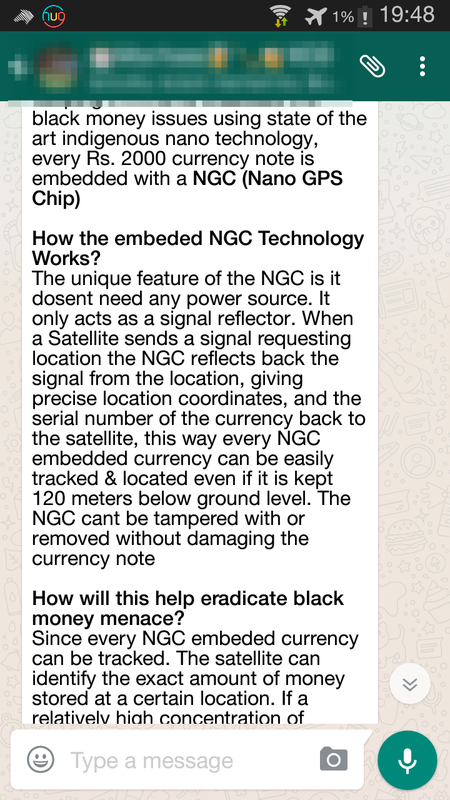 The day after PM Modi’s demonetization announcement I received a forward from a contact about Nano GPS in the new ₹2000 note. Now, this contact is a senior software engineer in a reputed firm. I was shocked to see this forward; I couldn’t figure out if he was merely playing mischief or if it was lack of knowledge. In a couple of hours I got a call and several messages asking if I had read about the Nano GPS and how true it was. False information doing the rounds on Whatsapp. Anyone with a little knowledge about how the GPS system works would know that it’s really, really difficult (read, impossible) to embed a powered GPS receiver inside a thin currency note. At the most, you can embed an RFID, but even that is difficult and expensive. At best, I could think of a bar code instead of a serial number and make accountants record it against every transaction; one could give it a fancy marketing name such as NanoGPS. But even that would entail mammoth effort and was practically impossible. That’s when I knew this was a case of fake news, which Whatsapp users were making real through their circulation. 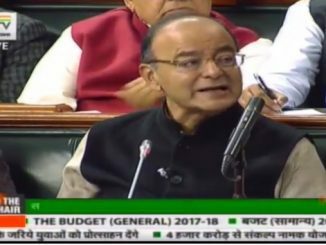 No one had seen the currency notes then, the technology had a cool name and sounded true especially when it came from a software engineer: in short, it had everything that’s needed for fake news to go viral. In a couple of days it was on TV. I still don’t know if my contact was the creator of this or he smartly forwarded this piece of information, knowing that there would be a good chance that this will be trusted. How do we fight fake news? We have read how big fake news was on Facebook during this election season. WhatsApp played a similar role during our 2014 elections. Even though WhatsApp wasn’t as big then as it is now, it fed the low quality news channels. Now WhatsApp is a much bigger problem. If you ask any sensible person in India what that one setting is which they like on WhatsApp, the answer would most likely be “mute on groups”. This is not to say that WhatsApp is not used for good work. I know lots of people who use it for productive work. Hence it is important to control this menace without government interference. Recently, a district collector of Indore issued an order banning Social Media Posts on demonetization which are objectionable in their view. On the surface, this looks like a solution for fake news but it isn’t. In fact, this one is more dangerous for real news than fake news. Government intervention should be limited to spreading real news, rather than controlling the medium or expression. It’s difficult to fight fake news while keeping an app’s end-to-end encryption safe but it’s not impossible. Today our email clients can fight a lot of spam just through pattern recognition offline. There are also ways in which WhatsApp can fight this issue without threatening privacy. For example, it could provide an option to mark numbers as spammers, similar to emails; providing API with e2e encryption intact so that external systems can be built to validate news; a service as simple as forwarding and getting a response when users wish. There has been some innovation on Facebook post-election. Now we need some creative, pro-privacy innovation on WhatsApp. However, it is also important to appreciate that more than a technical issue, this is perhaps a more serious issue with our critical thinking process. How do we make our people think? This article has been adapted from an original post on the author’s blog. The detailed, annotated version of the post can be read here. 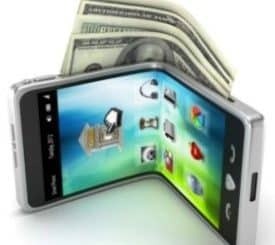 Avoid the ATM queues and mad scramble at banks; this article tells you how to make your transactions smooth and seamless using eWallets, whether you are a consumer or a business owner.